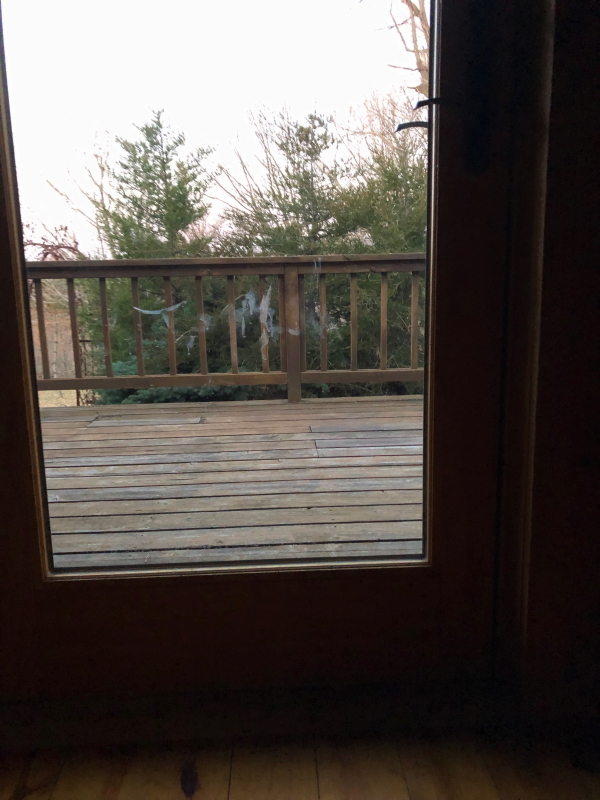 Over the weekend, while in the midst of my planking and stretching routine, I glanced out the bedroom door and noticed a message written on the glass. Delilah wrote it with her nose. What do you think she scribed? I think maybe she was referring to the endless taunt of squirrels frolicking about on the other side of our doors and windows, and her unrelenting urge to chase after them. Our chickens have been politely accepting the replacement ramp Cyndie fashioned out of some spare wire shelving, after her incidental demolition of my original ramp, when she killed the possum multiple times with a shovel back in February. But, the replacement was intended to be temporary, so I have been plotting “Ramp 2.0” for some time. I’m not sure it will be shovel proof, but I did try to beef it up a little bit. The chickens took a liking to pulling out the sticks in my first version, so I increased the weave to hopefully slow that process. 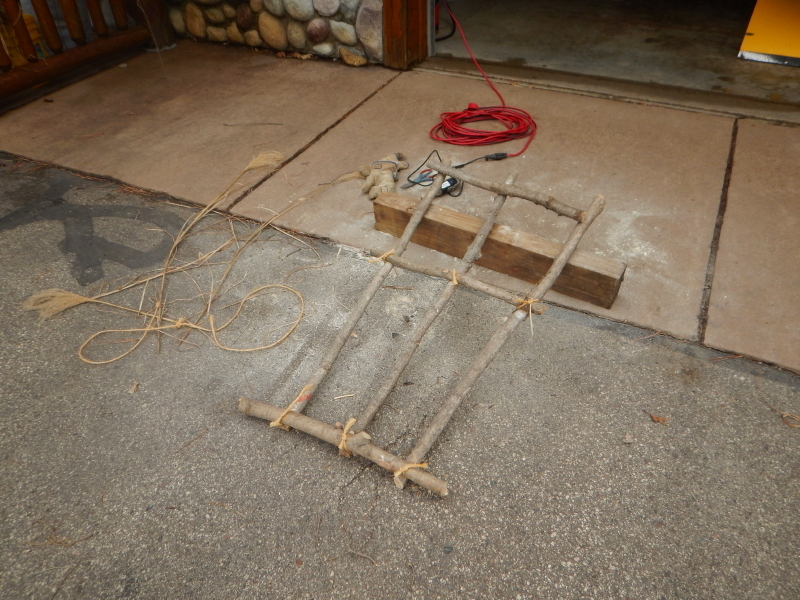 Initially, I tried grinding notches in the cross braces, hoping to “key” the branches to seat tightly together. It ended up being a wasted effort, as my technique was rather imprecise and the frame branches kept torquing and twisting out of the sweet spots as I wove sticks through. Since I increased the weave, adding two smaller vertical branches, it became critical that I find sticks that could really flex. 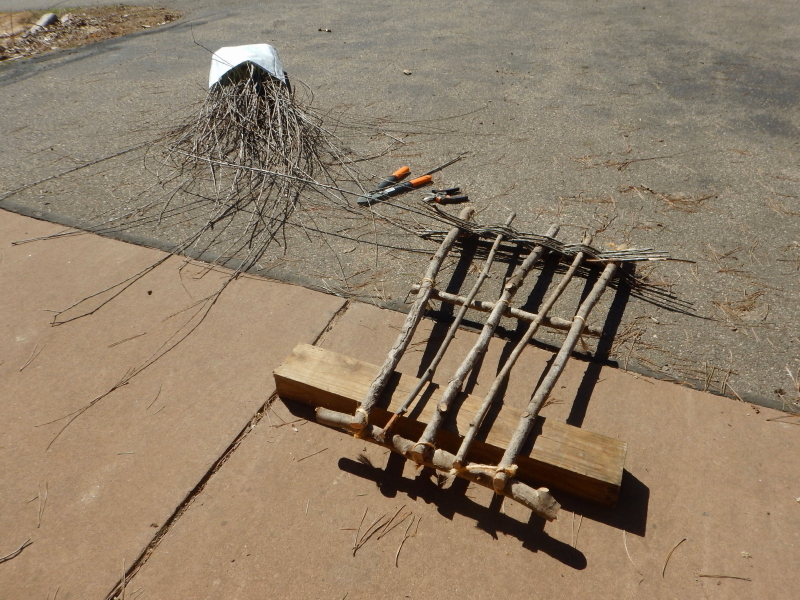 The solution came to me after winter storms brought down a massive number of branches from our willow tree this year. On a return trip to the tree for more material, I noticed there were some new branches sprouting from the trunk that were destined to be pruned, so I included those, as well. It was very helpful to have the “live” branches, because the closer I got to finishing, the less space there was to angle the branches into the tight bend required. Gives it a little color. Since the notched frame branches had shifted out of position, I decided to add some screws to lock things in place after the weave was complete. 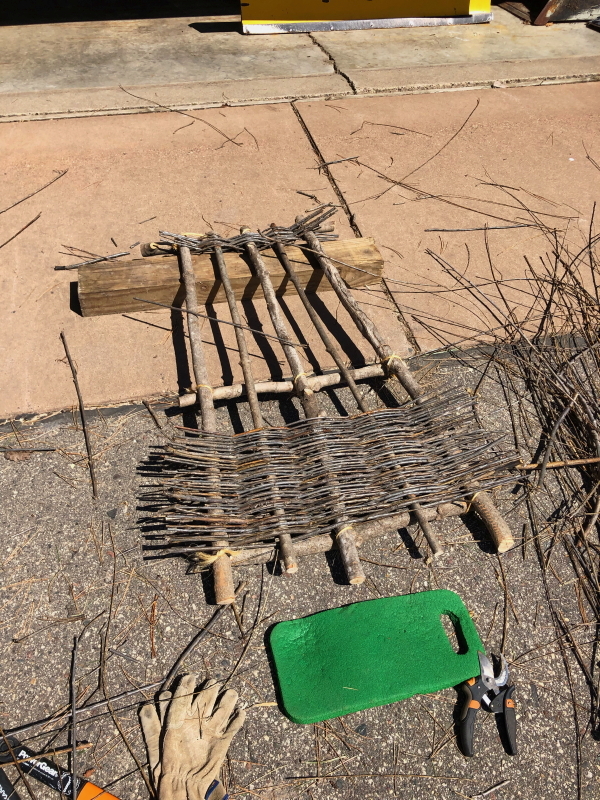 It is definitely more robust than the first ramp I built. 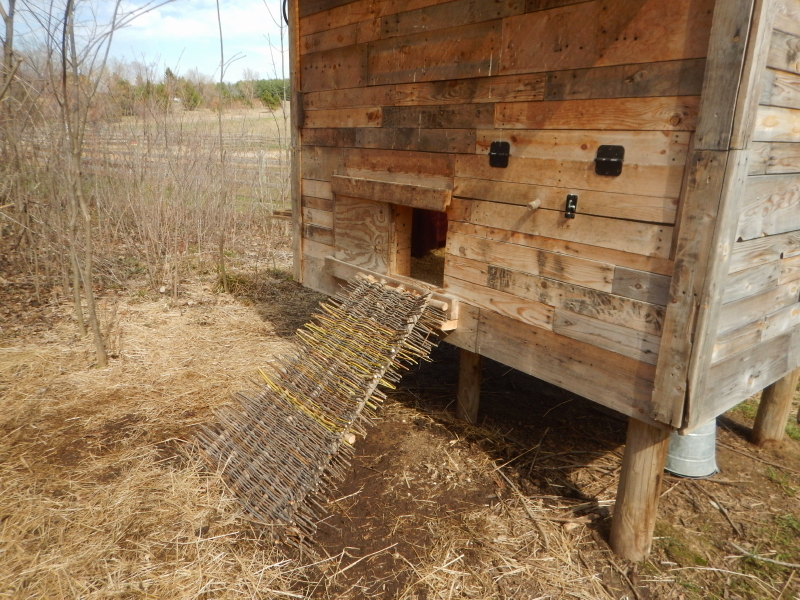 With that, the new ramp was ready to be mounted on the coop for chickens to test. I am interested in finding out if they will try to disassemble this one as much as they did the first ramp. Something about little sticks that seemed to just call to the chickens. I don’t think they could help themselves. It was irresistible. Maybe they won’t like willow branches and will just leave it alone. I have my doubts about that wishful thinking. Then what it will come down to is, whether my two additional vertical branches (the warp) will be enough to discourage the chickens from trying to pull (the weft) branches out. Worst case, I need to collect more willow branches. Luckily, that tree seems to offer up an unending supply. The horses are gone, but their manure is not. 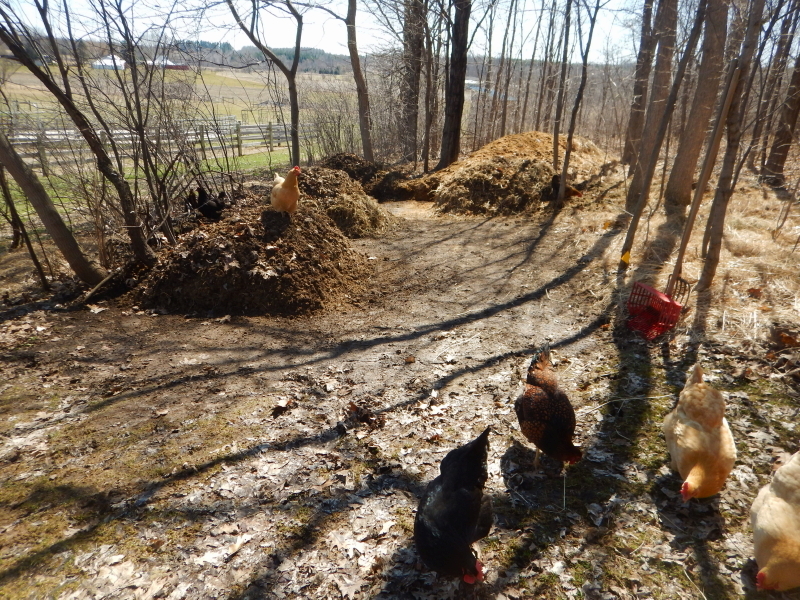 We have entered the final season of composting horse manure, with an extra large inventory of winter piles to be processed, both in the paddock and the compost area. The advantage I have this time is that there won’t be a new daily supply forcing me to constantly arrange for open space. That takes away a lot of pressure. I will turn these piles when convenient, but won’t fret about getting it done in the shortest time possible. Sadly, that burden has left the barn. It’s bittersweet. I’m thrilled over the release from daily manure duties, but I miss the energy of living with horses. This afternoon, a neighbor is planning to stop by to purchase some of our leftover bales of hay. 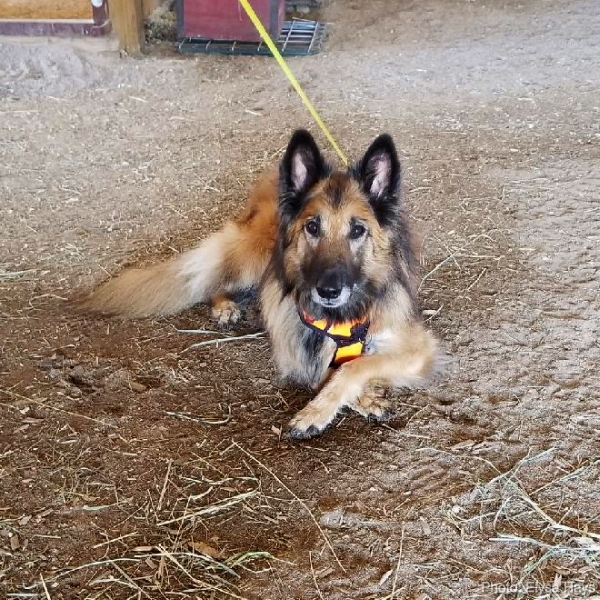 It is one small step in the slow transition of the very large project of getting rid of all the trappings related to keeping horses. We need to have an “Everything Must Go!” sale. Ropes, buckets, blankets, saddles, fly masks, halters, and brushes. Cyndie has itemized and priced everything that isn’t nailed down. 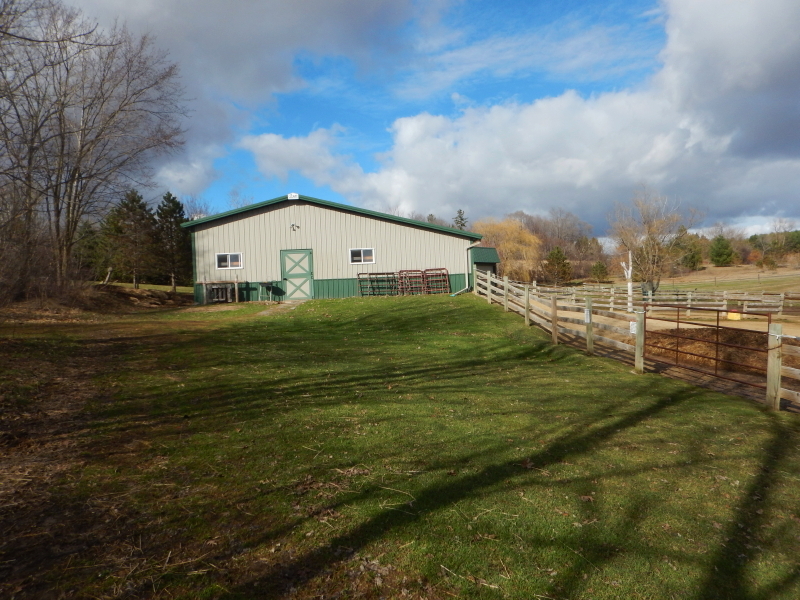 The panels that form our round pen are one of the highest priced items. I wouldn’t be surprised if she tried to sell the sand we brought in for that circle where her teaching took place. We talked about moving the gazebo over near the labyrinth. Seemed like a logical idea to me at the time, but thinking about it yesterday, I realized it would probably require disassembly to achieve. That’s a lot of hardware to futz with. I wonder how long I can put off that effort. I’m pretty sure I will be too busy turning compost piles. 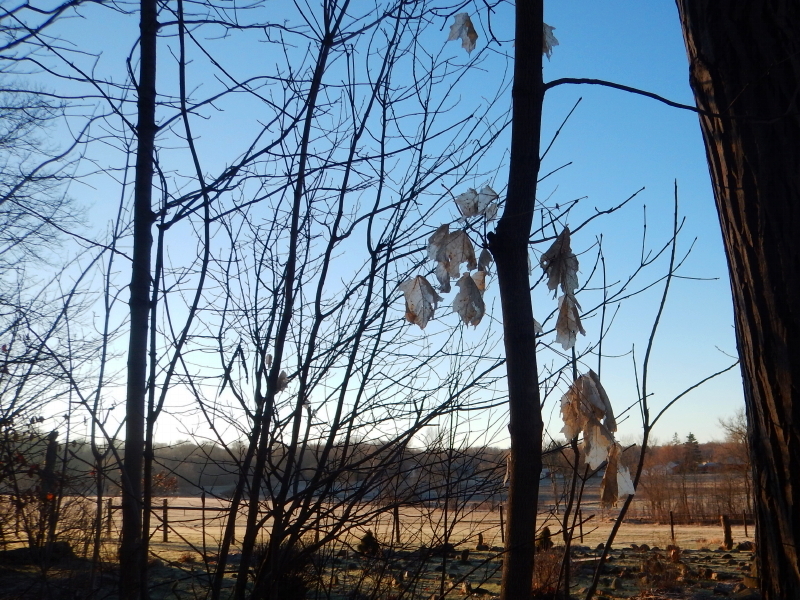 On a walk through the woods with Delilah yesterday morning, my attention was grabbed by some disintegrating leaves that never fell from the tree. 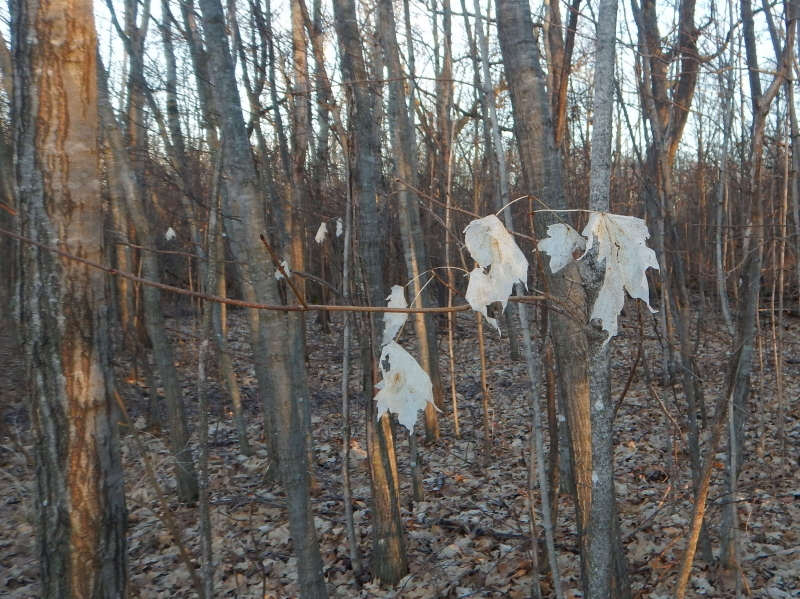 They looked like ghosts of leaves. Why did they not fall to the ground? Especially in the face of some wind gusts that were strong enough to break loose a roof panel on our wood shed. Yesterday, there was dead calm in the morning, so I took advantage of the perfect weather to work on replacing the busted section. Learning from experience, I added some cross supports that will better hold the overhanging side from flexing, should future winds blow from that same direction. 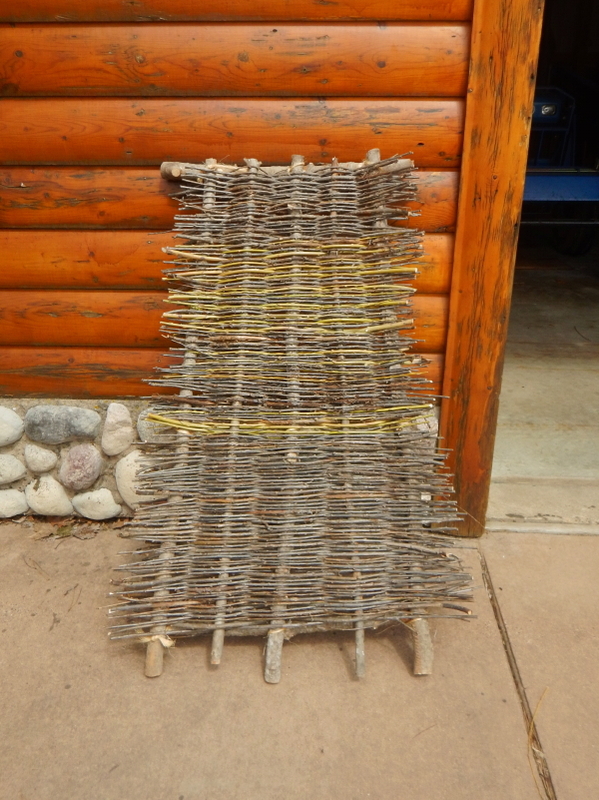 That simple structure, built to store split logs while they dry for a year, has provided multiple lessons from failure. When it blew over in a storm, I figured out a way to secure it to the ground by stringing some old fence wire over the cross beams and running it through the eye of earth anchor augers in three strategic locations. 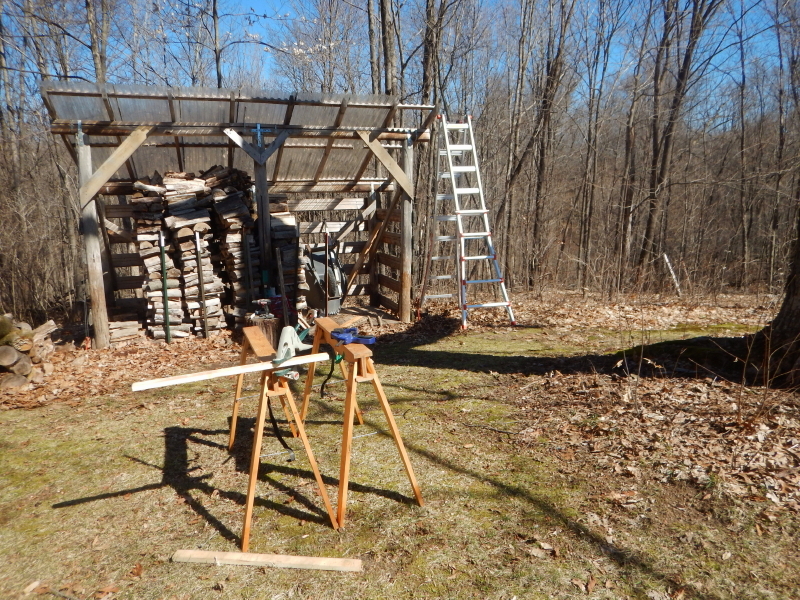 With the help of my friend, Mike Wilkus, who came to my rescue when re-assembling the shed after it had overturned, I learned how to improve the diagonal bracing to stabilize the overall structure. It leaves me wondering what the next failure will be that might teach me yet another lesson in the great world of being an amateur builder. There is no hesitating when it comes to nature. First, we had heavy snow, then a flash flood, followed by a little bit of sunshine. The grass responded in a blink. Yesterday, it turned a very summer-like green. I spotted a thorny thistle already looking established along the path we call the north loop. I’m sure mosquitos won’t be far behind. On the way home from work yesterday, I stopped to buy some supplies for a couple of projects that I have planned for the warm sunshine we are expected to enjoy this weekend. Knowing in advance that the panel I needed wouldn’t fit in my car, I brought along a battery-powered circular saw, in case Menard’s staff couldn’t cut it for me. I also included a tape measure, pencils, a straight edge, and my two portable sawhorses. But I forgot clamps. Having been advised by a sales assistant that such behavior in the parking lot might not be approved, I attempted to work swiftly. Obviously, they weren’t set up to do the cutting for me. It wasn’t pretty, but it was effective. I needed to cut a 4 x 8 foot panel into three pieces. Bing, bang, boom. In a flash, I was folding up sawhorses and returning everything back inside the car so I could slip away mostly unnoticed. Next time, I will remember clamps, to hold the panel down for cutting. She had forgotten to send it earlier, but my description of how Delilah loves rubbing her snout in the snow reminded her. 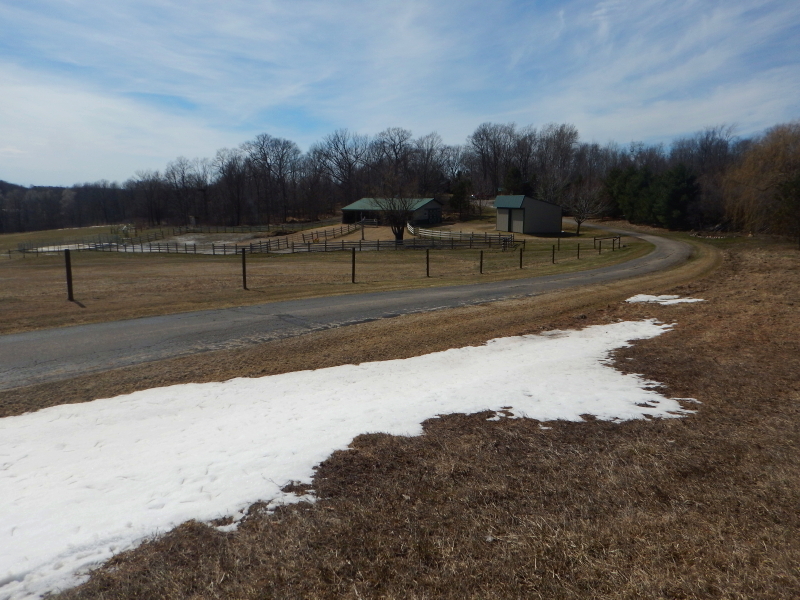 Just as I predicted, there is very little snow left now. It was very gloomy all day, and rained throughout, but being mostly chained to my desk, I didn’t really notice how much rain actually fell. All I had to go on for what was happening across the state line at home, was the weather radar. My main concern was over how the thunder might be upsetting Delilah. I wasn’t sure about what hours she might have the company of Anna, our animal sitter who helps out between classes at University of Wisconsin – River Falls. It’s hard to pinpoint the minutes of big thunder claps booming. 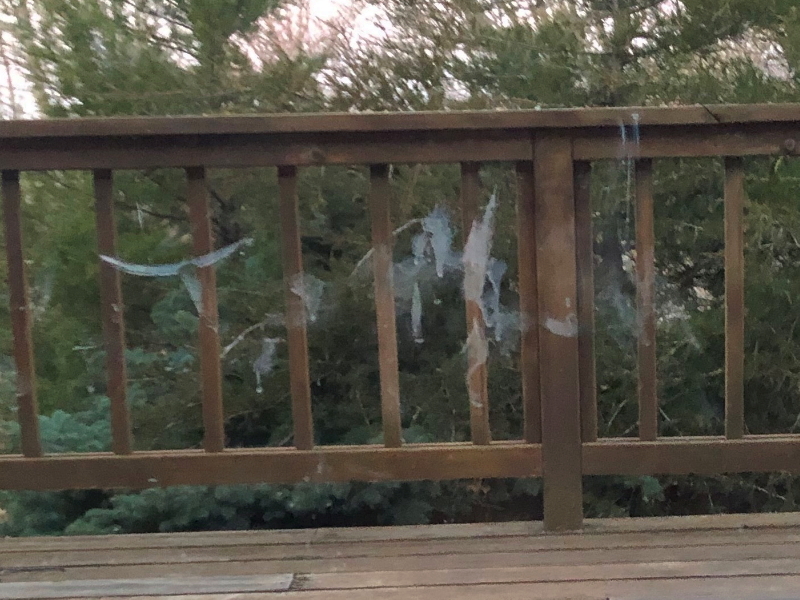 I did find the telltale evidence of a throw rug at the deck door pushed up into a pile, indicative of her usual tizzy of “shouting” down the big bully who is threatening us with all that rumbling noise. From her location and behavior when I walked in the door, I’m guessing she tired of the stormy weather and took refuge in the one place without windows. She didn’t get up until after I walked in –an uncharacteristic behavior– from the rug in a short hallway between bathroom and bedrooms, where she had obviously been sleeping. The situation at home turned out to be an anti-climax to the alarming sights I witnessed on my drive after passing through River Falls. The whole way from work was wet, but closer to home there must have been an extreme downpour. Just south of River Falls, I spotted the first epic flooding, where it was pouring over a side road, making it impassable. A short distance later, I noticed a car turning around on an adjoining County road. As my car moved past the intersection, I saw that a highway crew was trying to deal with a missing lane of asphalt that had washed away. Five miles from home, I cross what is usually a little meandering stream, but the outlines of the banks were completely indistinguishable beneath what was now a giant flowing lake. The water flowing in ditches looked like raging rivers. I worried about what I might find at home. Luckily, although there was an abnormal about of water wherever I looked, the damage was minimal. 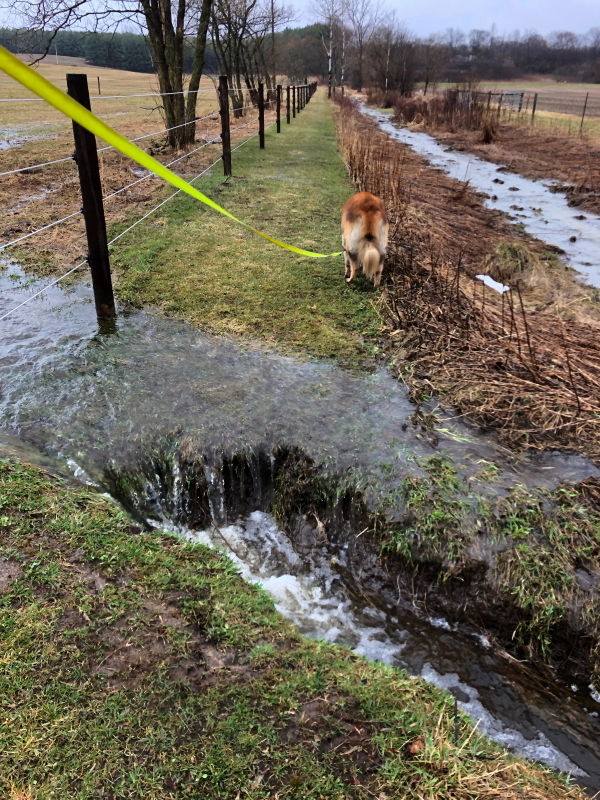 We now have a pretty significant washout on the path around the back pasture. I’m afraid I will need to resort to a bridge over that gully now, if I want to keep mowing that route with the lawn tractor. It used to be a slight depression that I could drop into and drive up out of, to keep mowing without interruption. Any attempt to repair the gulf with fill, so I could continue to drive over it, would just get washed away with the next heavy rain. That spot is calling for a load of field rocks, which then leads me to the plan of needing a bridge for the lawn mower. Our land is in a constant state of change. I think the rate of change is accelerating due to a certain alteration of the global climate. 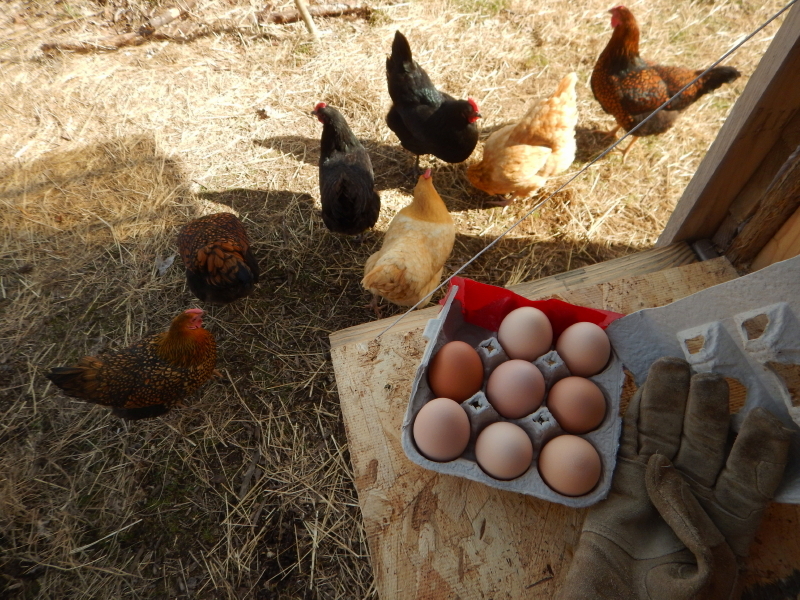 It is such a treat to open the access door to the nest boxes in the afternoon and find fresh eggs. Our lucky eight surviving hens seem as happy as can be with the hints of spring that have flashed for brief moments between blasts of foul weather. Yesterday, they rewarded us for their good fortune by providing the maximum eight eggs. The chickens are a far cry from having horses, but they are now the primary distraction filling the horse-energy void. The warm, sunny day yesterday had them actively scouring the grounds in a circuitous, wide-ranging meander. I generally walk Delilah in a direction away from where the hens happen to be hanging out, but it gets harder to do when they are moving around to so many places, in so quick a span of time. 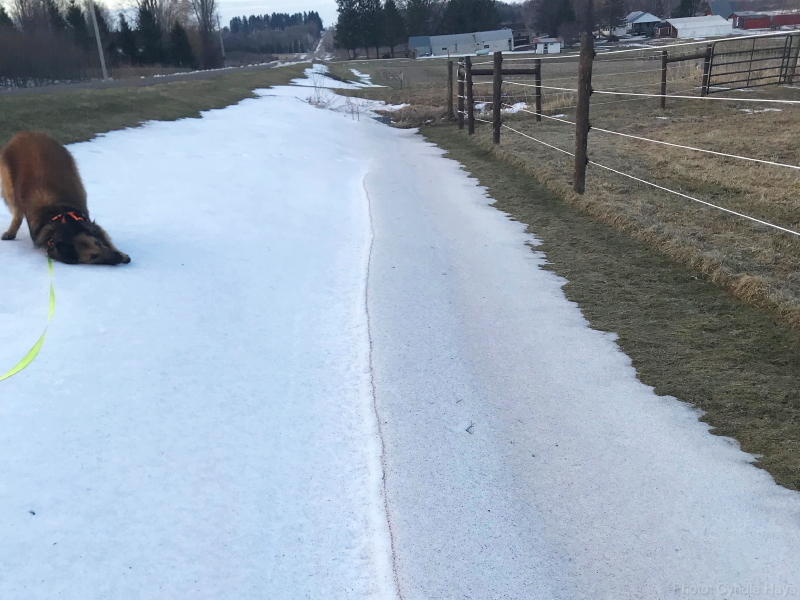 The dog and I made our way to the high spot by the driveway and messed around in some of the last remaining dirty snow. She likes to rub the sides of her snout in the snow to scratch a nagging itch. The cold temperature is probably soothing, as well. We are headed for a run of days with temperatures above freezing, so the rain moving in will likely finish off the dwindling patches of snow that have lingered. Hopefully, Delilah won’t switch to rubbing her face in the mud. Cyndie is flying to Florida for a few days again this week, so it falls on me if Delilah needs extra grooming. My methods tend to involve avoidance of hazardous areas, to ward off the need for putting in any extra clean up effort. 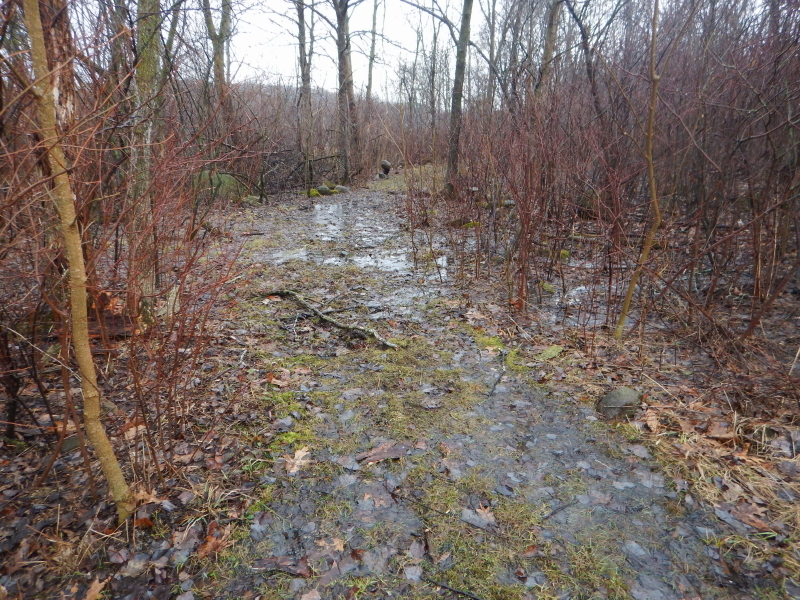 Our walks yesterday were strictly confined to areas where mud was at a minimum, but that worked because there happened to be a few areas that weren’t soaking wet. That ends as soon as the rain arrives. She may end up confined to the driveway pavement for the next few days. At the same time, since it’s not supposed to be freezing overnights, I could always pull out the kiddie pool. Yet, I’m just a little hesitant about testing fate like that, because with my luck, that might trigger another spring snow storm. You know, I think the chickens are actually easier to tend to than our dog.